Pizza first made its appearance in the United States with the arrival of Italian immigrants in the late 19th century. This was certainly the case in cities with large Italian populations, such as Chicago, New York City, and Philadelphia where pizza was first sold on the streets of Italian neighborhoods. In late 19th century Chicago for example, pizza was introduced by a peddler who walked up and down Taylor Street with a metal washtub of pizzas on his head, selling his wares at two cents a chew. This was the way pizza used to be sold in Naples, in copper cylindrical drums with false bottoms that were packed with charcoal from the oven to keep the pizzas hot. It was not long until small cafes and groceries began offering pizzas to their Italian-American communities. The first printed reference to "pizza" served in the US is a 1903 article in the Boston Journal. The first "official" pizzeria in America is generally believed to have been founded by Gennaro Lombardi in Little Italy, Manhattan. Gennaro Lombardi opened a grocery store in 1897 which was later established as the first pizzeria in America in 1905 with New York's issuance of the mercantile license. An employee of his, Antonio Totonno Pero, began making pizza for the store to sell that same year. The price for a pizza was five cents but, since many people could not afford the cost of a whole pie, they would instead say how much they could pay and they were given a slice corresponding to the amount offered. In 1924, Totonno left Lombardi's to open his own pizzeria on Coney Island called Totonno's. While the original Lombardi's closed its doors in 1984, it was reopened in 1994 just down the street and is run by Lombardi's grandson. Pizza was brought to the Trenton area of New Jersey very early as well, with Joe's Tomato Pies opening in 1910, followed soon by Papa's Tomato Pies in 1912. In 1936, De Lorenzo's Tomato Pies was opened. While Joe's Tomato Pies has closed, both Papa's and Delorenzo's have been run by the same families since their openings and remain among the most popular pizzas in the area. Frank Pepe Pizzeria Napoletana in New Haven, Connecticut, was another early pizzeria which opened in 1925 (after the owner served pies from local carts and bakeries for 20–25 years) and is famous for its New Haven style Clam Pie. Frank Pepe's nephew Sal Consiglio opened a competing store, Sally's Apizza, on the other end of the block, in 1938. Both establishments are still run by descendants of the original family. When Sal died, over 2,000 people attended his wake, and the New York Times ran a half-page memoriam. The D'Amore family introduced pizza to Los Angeles in 1939. I love pizza. What is your favorite pizza? In small bowl, combine garlic powder, parsley, thyme and onion powder. Set aside. Lightly brush olive oil on pizza crust. Take spreadable cheese and spread evenly over pizza crust, sprinkle garlic herb seasoning, then sprinkle mozzarella cheese. Place in oven. Bake 13 to 15 minutes, until bubbly brown and crisp. Remove from oven, sprinkle thyme. Slice the pizza and serve. Enjoy! My favorite pizza has almost everything on it...pepperoni, green and black olives, mushrooms, red onions! But, I'm in a rut and need to try something new and this looks SO good! 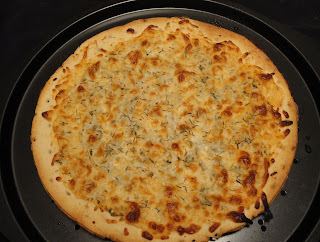 This is pretty much my favorite pizza, I would even add fresh garlic. This looks fantastic for a Friday night in front of the telly watching old movies. Have a wonderful weekend. I love Frank Pepe's pizza. This is a great history. I like all kinds of toppings but my one rule is only one meat at a time. It looks scrumptious. Happy Easter. I think my favorite is tandoori chicken pizza with mint raita..But I don't make it myself :) But this one looks great too, flavorful and yummy! 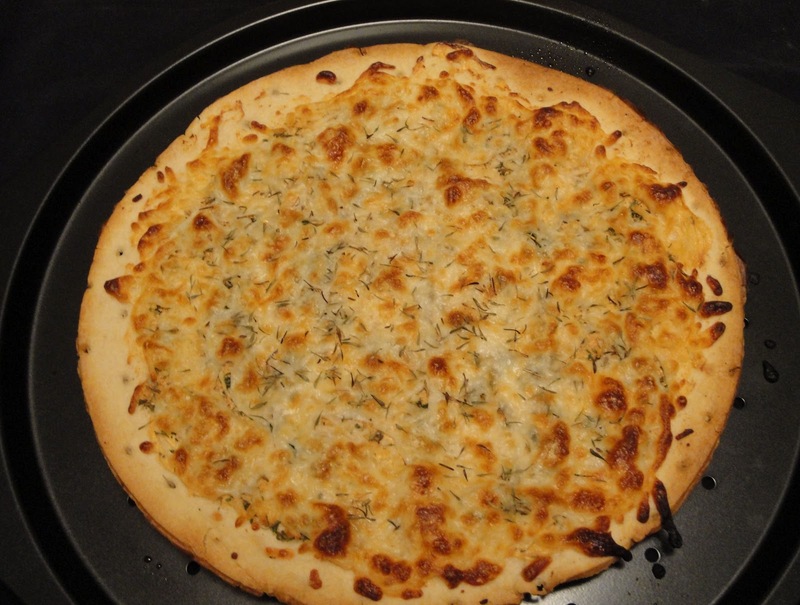 Mmm your garlic herb cheese pizza sounds delicious and so easy...I just might make me some pizza tonight:D Happy Easter to you! Your pizza makes me crave for some...going to make one for dinner! I love any kind of pizza ! Yours looks really yummy and tasty ! I think cheese and mushroom might top my list! Happy Easter, Christine! I love pizza. It's one of my favorite foods! Your rendition here looks delicious. Can't go wrong with all that cheese & garlic! My kind of pizza! I love using those spreadable cheeses! Yum! Happy Easter Christine this would be first on my list for that appetizer for my guests nice job! Looks delicious! The name caught me right away and I was hooked. That is a fabulous-looking pizza--and very close to my favorite, which is a basic margherita pizza. Now this looks awesome!! I love the flavors and simplicity... totally my kind of pizza! Love the simplicity of this pizza! This is totally my kind of pizza!! This looks so good! I'm so obsessed with garlic and herb anything :). I love Margherita pizza... just tomatoes, basil and fresh mozzarella. So simple but so good.